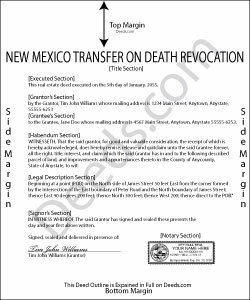 On January 1, 2014, New Mexico joined with eleven other states to enact the Uniform Real Property Transfer on Death Act (URPTODA), found at Sections 45-6-401 through 45-6-417 NMSA 1978 (2014). This updated law enhances and adds clarity to the previous transfer on death statute already in force in the state. Real estate owners who record a transfer on death deed (TODD) under the URPTODA retain the ability to revoke the recorded conveyance. These deeds offer a potential future interest but no guarantee of anything; the beneficiary only gains title to the property rights present when the owner dies. Why does revocability matter? Life is unpredictable. For example, the original beneficiary may become unable or unwilling to accept the property. Marriage or divorce could alter the nature of the relationship between the owner and the intended recipient. The owner/transferor might decide to use the land another way. Regardless of the reason, the ability to cancel or modify a recorded TODD without involving the courts or restructuring their entire estate plan lets owners resolve unexpected issues in a relatively simple way. There are three primary methods for revoking a transfer on death deed, as defined in the New Mexico Statutes at 45-6-411. 3. an inter vivos deed (such as a warranty or quitclaim deed) that expressly revokes all or part of a previously recorded TODD. Timely recording is essential for all documents dealing with ownership of real property, but it is even more important for documents associated with transfers at death. Just as with a TODD, the revocation must be recorded during the owner's life in the office of the clerk for the county in which the deed is recorded or it has no effect. In addition to the reasons discussed above, consider filing a revocation form prior to selling real estate previously identified in a recorded transfer on death deed. Documenting the change helps to maintain a clear chain of title (ownership history) by closing out what might otherwise look like a potential claim against the property. A clear chain of title makes future transactions involving the property less complicated. The right to revoke or modify a recorded transfer on death deed adds flexibility to a comprehensive estate plan. Executing and recording a statutory revocation form allows owners of New Mexico real estate to control the distribution of their property at death without the need for a will or probate. Each circumstance is unique, so contact an attorney with specific questions or for complex situations.